According to Uchay Ariolu, the founder of Foodstantly, roughly 90 percent of Nigerians shop in open air markets that are dirty, disorganized and opaque from a pricing perspective. Foodstantly is trying to change that with ready-to-make food kits and fresh groceries and wholesale meats, poultry, fish and produce. Foodstantly lets farmers and food processors upload a profile and begin selling in minutes. Quality control is handled by the company’s own delivery providers and customers who provide feedback on the quality of goods that are bought from different vendors. If vendors fall below a certain rating, Ariolu says they are removed from the service. So far, Foodstantly has 1,000 sellers and roughly 3,000 registered buyers for its service. Consumers can buy food by category, location, or cuisine. 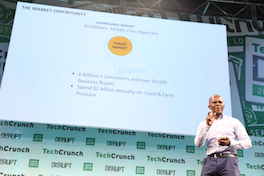 Because the company sources locally, Ariolu says deliveries happen in no more than 45 minutes.